The plate collecting fraternity knows him as "Uncle Don". Don Merrill has placed his stamp on plate collecting for over forty years. 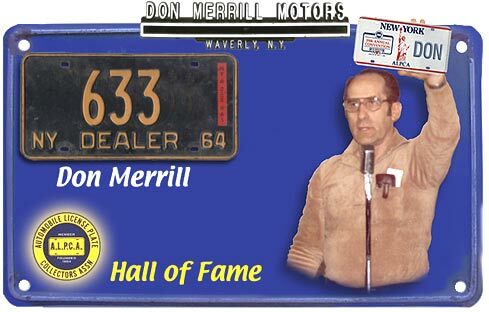 A life long resident of Waverly, New York, Don owned and operated Don Merrill Motors. Now semi-retired he still buys and sells antique cars to maintain his dealer license. Don and his wife Carol have resided in their beautiful 1869 Victorian home for nearly 50 years. Don at his own expense built and has supported the Waverly Historical Museum. His love of history and sense of preservation have been paramount factors in his life. His generosity and exemplary character have benefited the club and the membership beyond measure. Don was quite possibly the first collector in ALPCA history to apply business principles to license plate collecting. At a time when most hobbyists saved plates casually and randomly, Don established a defined goal of assembling a complete United States collection, and developed a strategy for accomplishing it. Within fifteen years, he met his goal, becoming the first and to date only collector to do so. He was the first collector to develop a method for displaying plates that remains the standard to this day. Don devoted countless hours planning and managing numerous national conventions throughout two decades. He negotiated with hotels and convention centers with the guile of a car dealer. Use of those skills resulted in many a great time for club members. Not content to manage conventions Don was auctioneer extraordinaire at the shows and helped raise thousands of dollars for the club treasury. Don appeared on the 1950's quiz show "What's my line?" promoting his hobby of license plate collecting. He was likely the first person to receive national recognition as a plate collector. Don sold his United States run a few years ago but that doesn't mean he quit collecting. He retains a very impressive collection of low numbers, political and special interest plates. Don also has an impressive collection of numerous other types of antiques. Not to be outdone Carol has an outstanding collection of early toy sewing machines. In the plate collecting fraternity a visit to Waverly was and remains a visit to Mecca. Don served the club as Director from 1975 to 1981 and as National Convention Chairman for twenty years. For his many years of dedicated effort and inspiration to others, ALPCA is proud to welcome Don Merrill to the Hall of Fame.